Starting tomorrow, I will attempt the Kilimanjaro. I just wrote an email to my colleagues so they know I'm away for a good eight days. The email had an addendum about the details of the trek. I got so carried away by the planning that I'm sharing the plan here in my blog. In brief: The start is tomorrow Wednesday late afternoon by train from Munich to Frankfurt. Flight with Ethiopian Airways via Addis Ababa to Arusha. First night on 890 m in a lodge, in which I will leave my laptop and other seemingly superfluous equipment. On Friday 3,5 hours in a jeep to the starting point, Rongai, on 2020 m. Then a 2-3 hour trek 800 vertical m to the first night in a tent on 2820 m.
The second trekking day means 3-4 h, 1000 vertical m to 3800 m. The third day, appropriately a Sunday, we rest and try to get adjusted to the height. 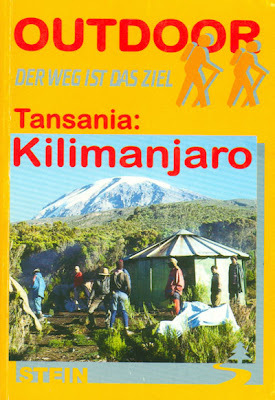 On Monday again 3-4 h of trekking, 1000 vertical m to Kibo Hut 4703 m.
On Tuesday 24.2.2009 we get serious at one hour past midnight. Pitch dark, head torches on. We have 1000 vertical m already to Gilmans Point on 5715 m. Then it's more flat to the top, Uhuru Peak on 5895 m. It's one of the Seven Summits, let's see whether we make it. And then we'll have to walk more than 2000 vertical m down to Horombo Hut on 3720 m. Those huge amounts of vertical metres hurt my knees at least when descending Mt Blanc. Wednesday we have botanics on the schedule, 5 h of walking 2000 m down to 1720 m. Forest, moor, jungle. Happy (and safe) trekking Kaj!